To obtain a nearly-existinct tree, Ted must discover the story of the Lorax, the grumpy yet charming creature who fights to protect his world. 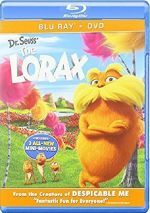 An adaptation of Dr. Seuss’ 1971 book, 2012’s The Lorax takes us to Thneedville, a walled city in which not a single living plant exists. Instead, artificial plants dominate and smog forces inhabitants to use piped-in air to breathe. Teen environmentalist Audrey (voiced by Taylor Swift) desperately wants to see a real tree. 12-year-old Ted (Zac Efron) has a crush on her, so he attempts to get what she desires. This sends Ted on a quest to locate a Truffula Tree for Audrey. Along the way, he learns what brought Thneedville to its current state and about the Lorax (Danny DeVito), a creature who speaks for the trees. When Lorax hit screens, people of a certain political stripe bemoaned it as heavy-handed environmental proselytizing, all intended to indoctrinate the young minds who saw it. Which might well be true, but snowflakes like me think that’s a good thing – seriously, how cynical do you have to be to oppose nature and trees? In any case, the folks who saw red about the movie aimed at the wrong target. While the cinematic Lorax indeed advances an environmental agenda, it follows the source in that regard, as Dr. Seuss’ book pushed precisely the same pro-environment concept. As with every big-screen Seuss offering, Lorax needs to expand on the original novel. A short text crammed with illustrations, the book didn’t offer an expansive story with enough material for a feature film, so inevitably, Lorax adds new elements – like Ted and Audrey and their whole plot. None of these moments seem problematic, but Lorax comes with a somewhat odd structure, as most of the movie comes from flashbacks. Primarily, Lorax tells us about the Once-ler (Ed Helms), the founder of Thneedville and the one who devastated natural life despite the Lorax’s warnings. Given his status as the title role, you’d expect the Lorax to dominate the film, but this doesn’t happen. Instead, he plays a surprisingly small part, once in which he acts more as the Once-ler’s conscience than anything else. This appears to replicate the source book pretty well, as it mainly consisted of the Once-ler’s memories. However, the addition of so much material related to Ted further diminishes the Lorax’s role. In the book, an unnamed boy visits the Once-ler to hear the legend of the Lorax. The flashbacks follow that side with reasonable fidelity, though the movie Lorax still seems less active than in the novel. It’s because we devote so much running time to Ted’s life and adventures that the Lorax becomes such a secondary role. He pops up occasionally to nag the Once-ler and that’s about it. Even when the movie includes the Lorax, it spreads itself thin. Honestly, the filmmakers seem more enchanted with all the forest animals than with their mustachioed orange lead, so we see the Bar-ba-loots, Swomee-Swans and others to such a degree that we again lose track of the main character. Again, I understand the need to expand the source, but I wish that the filmmakers did so in a way that still allowed the Lorax himself to feel more prominent. He comes across more like Jiminy Cricket than the lead in the film. At times, it feels like the filmmakers would like to focus solely on the Bar-ba-loots. Voiced by the same people who acted the Minions, the Bar-ba-loots remind me a whole lot of those yellow oddballs, and I have to suspect they hoped the Bar-ba-loots would “break out” in the same way. Ironically, this means much of the anti-consumer Lorax seems oriented to sell toys. I can’t find much true narrative reason for the film to focus so much on the Bar-ba-loots, so the feel like they’re there to push merch. I do respect the message of Lorax, and the actors make it more entertaining than otherwise might be the case. Despite the title, the Once-ler stands as arguably the movie’s focal point, and Helms portrays his evolution well. DeVito also does fine with his semi-limited time as the Lorax. It seems odd to cast then-24-year-old Efron as a 12-year-old boy, especially since Efron does nothing to modulate his voice to sound more youthful. We’re told Ted is a kid but he sure sounds like a grown man. In any case, the actors do fine, and the movie musters passable entertainment value. It just seems spread too thin, as it can’t find enough good material to cover its 87 minutes. The Lorax appears in an aspect ratio of approximately 1.85:1 on this Blu-ray Disc. Computer animated films tend to look good on Blu-ray, and Lorax followed that rule. Sharpness was fine across the board. Across the board, the movie delivered satisfying definition, with no obvious softness on display. No signs of jagged edges or moiré effects occurred, and edge haloes were absent. Of course, print flaws never manifested themselves. Colors tended to be broad and bold, though the film opted more toward orange/teal than expected for an animated tale. Given the fact the title character is orange, this didn’t become a big surprise, though, and the hues still boasted nice range and impact. 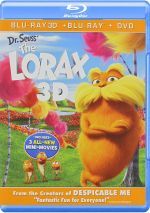 With Lorax, we got a DTS-HD MA 5.1 soundtrack that offered a lively soundscape, especially during the action sequences. Those fleshed out the spectrum in an involving way and gave us many chances for movement. Audio quality seemed pleasing. Speech always sounded distinctive and concise, while music was peppy and rich. Effects offered solid reproduction, with clean highs and deep lows. I liked this mix and thought it gave the movie life. As we head to extras, we open with an audio commentary from director Chris Renaud and co-director Kyle Balda. Both sit together for this running, screen-specific look at the source’s adaptation and story/characters, character, set and visual design, cast and performances, music, editing and related domains. While Balda chimes in on occasion, Renaud dominates this track, and that’s fine with me, as he offers a simply outstanding view of the film. The commentary touches on a wide array of subjects and does so with depth and involvement. Expect a really good view of the film here. A staple of Illumination releases, the disc provides three Mini-Movies. We find Wagon Ho! (3:10), Forces of Nature (2:14) and Serenade (3:19). All three take place in the Lorax universe and they use original voice talent, which acts as a nice bonus. The mini-movies tend to focus on the film’s bear characters, and they’re moderately entertaining. To look behind the scenes, we go to Making of the Mini-Movies. 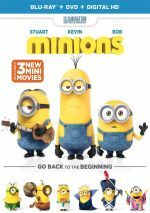 This three-minute, 31-second clip features Balda, producers Chris Meledandri and Janet Healy, and screenwriters Ken Daurio and Cinco Paul. As expected, “Making” gives us a few nuggets about the mini-movies. It’s far too short to tell us much. One Deleted Scene lasts one minute, 31 seconds and actually offers an extended sequence. We see more of how the townsfolk embraced the thneed. It offers a mildly enjoyable addition. Under O’Hare TV, we get an alternate way to view the feature film. With this activated, occasional interruptions disrupt the movie to show promotions from O’Hare Industries, and they add seven minutes, 42 seconds to the flick’s running time. That’s a cute concept, but it doesn’t work. Though the O’Hare clips offer amusement, they destroy the movie’s flow and become more of a distraction than a bonus. With Expedition of Truffula Valley, we get an interactive piece. It includes character bios, concept art/animation tests, and various videos. In the latter domain, we see story artist Mark O’Hare teach us how to draw different characters as well as story reels and character-related comments from production designer Yarrow Cheney and actors Danny DeVito, Betty White, Zac Efron, Rob Riggle, and Taylor Swift. Cumulatively, “Expedition” brings some decent tidbits, but the format feels clunky and awkward. It's not a bad addition to the set but it doesn’t work particularly well. Next comes Seuss to Screen, a four-minute, 27-second reel with Efron, Swift, DeVito, Cheney, Balda, Meledandri, Renaud, computer graphics supervisor Bruno Chauffard, and actor Ed Helms. “Screen” looks at various elements related to the movie’s adaptation. Though short, it gives us a decent view of these challenges and choices. Another interactive component, Once-ler’s Wagon provides additional character animations. Click on any of the on-screen icons and you’ll see very short snippets with Lorax, the bar-ba-loots and others. It’s a pretty forgettable compilation. A game called Get Out of Town uses a Mario-style side-scrolling format in which you move Ted to escape Thneedville. How much you enjoy it will depend on your tolerance for its clunky controls. It’s fun in theory but at least on my system, it didn’t play smoothly. Another game, Truffula Run requires you to move the Lorax around the screen to collect plants and avoid tree stumps. It comes with three levels of difficulty, none of which make it especially engaging. We follow with a Sing-Along for “Let It Grow”. This lasts three minutes, 42 seconds and accompanies the song with animal-related visuals. It lacks value. One Easter Egg appears on the main screen. Click the Truffula seed on the main menu and it cues you to come back after you visit other aspects of the Blu-ray. Eventually the tree grows to full size. The disc opens with ads for Barbie: The Princess & the Popstar, McKenna Shoots For the Stars, and Paranorman. No trailer for Lorax appears here. An adaptation of a Dr. Seuss book, The Lorax comes with a good cast and an admirable message. As a film, though, it lacks consistency and fails to coalesce into anything particularly effective. The Blu-ray boasts excellent visuals as well as very good audio and an inconsistent collection of supplements. While I like aspects of Lorax, the end result sputters somewhat.